I’m not sure if there’s such a thing as invisible metaphors, but one thing’s for sure: there has to be an invisible sun. I like your metaphor of “coming up with weird doorknobs and then looking for a house to put it on”–I often have that kind of reaction to things like this, but I suppose projects like this will lead to other innovations that do start with (rather than end with humans). 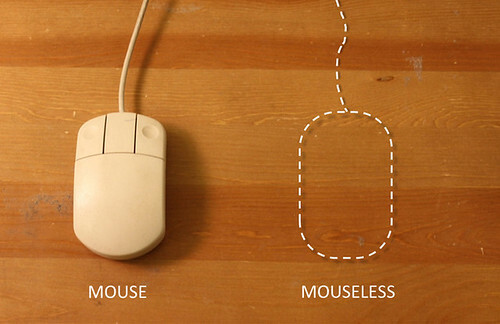 I don’t think the mouse metaphor is appropriate without the mouse. The gestures and interactions that go with the mouse are arbitrary without the mouse, because they’re linked to a certain use of physical space, a range of motion, a hand and arm position, and a set of finger actions that only exist because of the mouse. When you translate the mouse’s functions to touchpads, touch screens, joysticks, track balls, et cetera, you get different uses of space, different hand and arm positions, appropriate for the device. So what would the positions and motions be if you didn’t have to touch the input device? Ultimately I agree that metaphor is inevitable here, because it wouldn’t be possible to replace the mouse without having some other spatial metaphor to what’s on the computer screen. May I ask about the “document that pleads for the end of metaphor and direct manipulation”? Something I’d be able to find a copy of? Hey Dan, thanks for the comment! I think you may be suffering from the same issues and questions that make my stomach hurt! As for the document — I wish I could share it, but it’s *confidential. It doesn’t answer much, but continues to pose the questions. In part — one part of maybe seven points — it issues a call for the end of metaphor in UI/UX, which I don’t understand at all. Like — I’m not sure how one does that at all, remove metaphor from an interface design. Perhaps its something way beyond what I am thinking. It’s certainly curious to think about. I remember when I was involved in VR in the early 1990s, Jaron Lanier was saying that this would be the end of symbolic language and it would all be *natural and *gestural. I think the points are similar in these statements about direct UI and no metaphors. We’ll see — certainly exciting topics to consider! Maybe the people who call for the end of metaphor are really only thinking of certain types of metaphors. After I wrote my comment, I started to read Mike Kuniavsky’s blog, and I realized that his discussion of metaphor focuses mostly on conceptual metaphors. But I was thinking that any kind of spatial mapping is a metaphor, too. 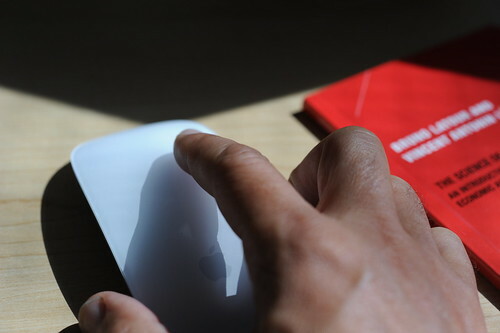 So a computer UI connects us to data and functionality through the metaphor of a desktop, but a mouse or touchpad connects us to the computer screen by turning a flat surface into a metaphor for the screen. In that case, the argument is really about getting rid of metaphor, but about reducing the distance produced by metaphor or removing the conceptual layers…direct manipulation relies on metaphors with the fewest layers.